Hey! Want To Legally "Steal" My Product And Put It To Work To Instantly Start Making YOU Sales? Read this quick 5 minute message to learn how you can take one of my offers, use it as your very own, and make up to $997 per sale! Resale rights are by far my favorite thing! I love getting my hands on a hot seller, and turning around and making a killing with it. I’m going to assume you’re like me and love when you can score rights to something that's hot and plugin it into your business to make a killing. I mean who doesn't like NOT having to do the work and just grab something that makes money and plug it in? Today, I want to give you another reseller opportunity that can make you up to $997 per sale! This is not a marketing ploy! I’m only allowing 20 people period in on this reseller opportunity, and right now there are only 14 of those 20 spots left! Here's How You Can Make Up To $997 Per Sale! I put a lot of time and effort into these. Developing all 6 of those membership sites, the 12 months of content for each of them, the member's area for each of them, the sales systems for each of them, and the emails for each of them. It was A LOT of work… It took me a lot of time and a lot of money! As you can imagine people went nuts over them and I made a lot of money selling resell licenses to them. 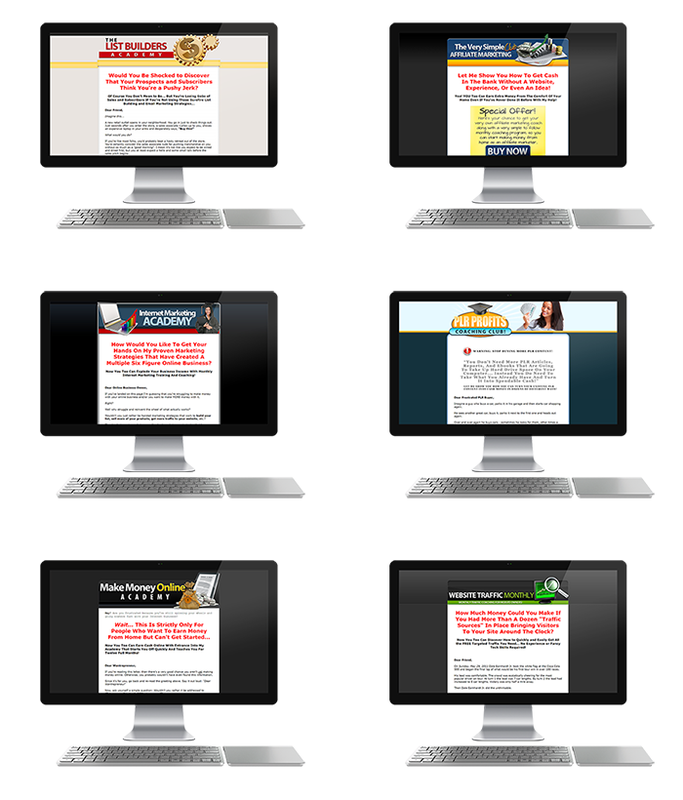 Now you can sell the reseller licenses to all 6 of these memberships and make up to $997 per sale! In a nutshell, you'll be offering your audience 6 ready to go membership sites. When they buy from you they get a reseller license to each of the 6 membership sites. Each of the membership sites comes with a sales page, 12 months of content, a fully developed member's area, and emails to automate the content delivery process. You’ll get your own ready to go page that offers your audience a reseller license to all 6 membership sites. You'll also get your own download page that YOUR customers will be sent to. You’ll place YOUR order button on your sales page, and when your customers order, you'll keep 100% of all the profits from YOUR customers. Everything you need to sell resell licenses to all 6 memberships is included, and you can charge your customers up to $997 and keep all the profits! I’ll give you everything you need to start selling this offer as your own! Just give me the information I need to do it, and I’ll have you up and going in about 48 hours from right now. This is like getting your own product that pays you up to $997 per sale! I'm In Liz! What Next? If you sold this to your audience at the bare minimum $197 price, if you make just THREE sales you’ll make your money back PLUS $94! If you sold this at the suggest price of $997 just ONE sale and you'll make a $500 profit! It’s such an incredible offer with a ton of value packed into it that it’s NOT hard to sell to others. It’s actually an easy sell because so many people NEED it. That’s what I call a no-brainer offer! After purchase you’ll be taken to the download page where you can download everything and use it to start selling this opportunity right away! 1. Liz, What other stipulations do you have with this opportunity? 1. Like I said, you have to promise you won’t charge less than $197 for this opportunity. The regular price is $997 and that’s where I recommend you set your price. If you want to do special offers or give discounts that’s fine. Just nothing under the $197 price point. Liz, Can I change anything? You can change the sales copy for the offer, you can change the graphics and layout, add in your own bonuses (yes you can use mine). The only thing you can’t change are the downloads that your customer gets. They need to stay as is and totally intact. Liz, Can I have affiliates promote this for me? Absolutely and I highly recommend it. Getting people to promote this for you is the quickest way to make money. Especially if you don’t have a list or audience of your own. If you need help setting up an affiliate program I can jump on the phone with you and help you out with that. Liz, Can I add this to one of my own offers? No. This needs to be a standalone offer. You can add to it (like your own bonuses), but you cannot add this to an offer you already have. It cannot be used as a bonus either. If you have others just send me an email and I’ll be more than happy to answer them, but if you’re ready to jump on this opportunity and grab one of the 20 spots, then just click the order button below and once your payment processes you’ll be taken to the download page where you’ll be able to download the sales material and get started selling this offer as your very own!